Hello and Happy St Davids Day to all my Welsh followers! This is by no means Welsh but it is yummy. They’re quick and easy to prepare and there’s no need to preheat the oven! Only a few ingredients are needed but there’s no skimping on taste. The custard cream biscuits add their distinctive flavour and the sweet marshmallows provide a chewy, almost nougat-like texture. Swap custard cream biscuits for your favourite biscuit instead – how about Oreos or bourbons biscuits. Line an 8 inch x 8 inch tin with baking parchment. Crush the custard cream biscuits into fine crumbs. To avoid mess and a sore arm, you can simply blitz the biscuits in a food processor. Put the marshmallows into a large bowl along with the butter. Place the mixing bowl into the microwave and heat on high for 1 1/2 minutes, or until the marshmallows have puffed up. Take the bowl from the microwave and stir. You may find that some of the marshmallows that have held their shape will melt into the rest of the sticky mixture as you stir, if not microwave for a further 30 seconds. Quickly pour the custard cream biscuit crumbs into the melted marshmallow and butter mixture and stir. If you wish to add the chopped glacé cherries or chocolate chips, now is the time to do so. Add half of the chopped cherries now and reserve the remainder for later. Give the mixture another good stir. It will be a rather stiff mixture by now! Spoon the sticky marshmallow and biscuit mixture into the lined tin. You should be able to use a greased spoon to press the mixture into the tin. 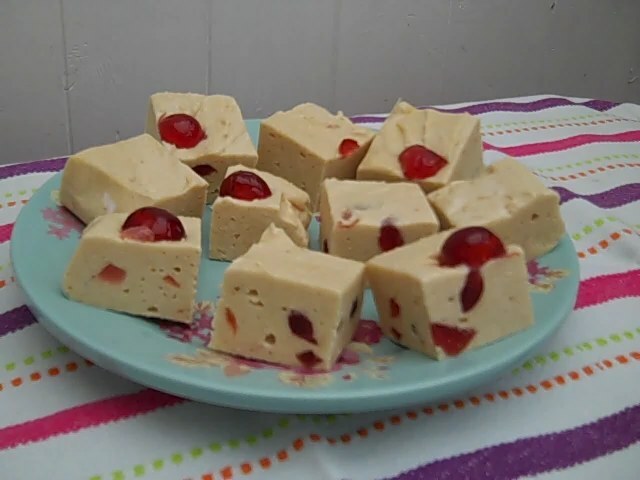 Press the remaining chopped glacé cherries into the surface of the biscuit bites. Leave the bites to set in the tin for an hour or so. You can speed up the process by placing the bars in the fridge to firm up. Make sure the bites are at room temperature before slicing. Enjoy! This is rich and delicious, it’s moist and gooey with a generous amount of fudge icing. Store in a cool place but not in the fridge so that the texture doesn’t spoil. Pre heat the oven to 160C/gas 3. Line a 20 cm/8 ins square cake tin. Put the butter, chocolate and cream in a heatproof bowl and place over a saucepan of simmering water, heat until melted. Leave to cool slightly. Put the eggs and sugar in a bowl and beat well until the mixture begins to froth. Stir in the cooled chocolate mixture. Sift in the flour and beat until incorperated. This is going to be very liquid. Pour the mixture into the prepared tin and bake for 40 – 45 minutes, or until firm to the touch. Leave in the tin for 10 minutes before transferring to a wire rack to cool completely. For the fudge icing, 175g/6 oz of the chocolate in a saucepan with the syrup and butter. Heat gently, stirring frequently, until the mixture is smooth and glossy. Transfer the mixture into a bowl and beat in the icing sugar. Cut the cake in half horizontally and spread half the fudge icing on the bottom piece. Place the other piece of cake on top and spread the remaining fudge over the top of the cake. 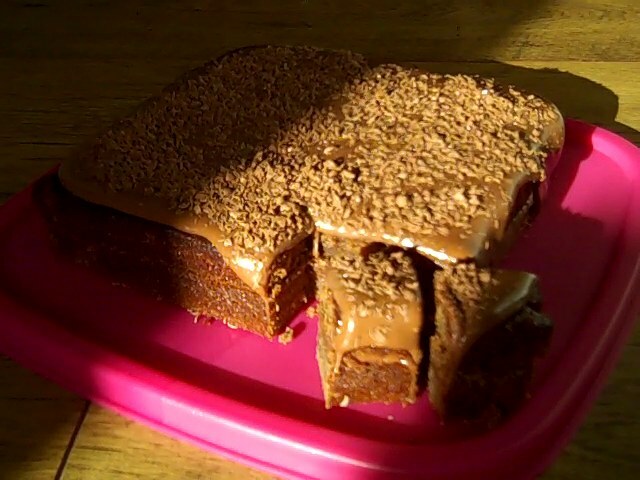 Grate the remaining chocolate and scatter over the top of the cake. Cut into small bite sized pieces as it’s very rich.